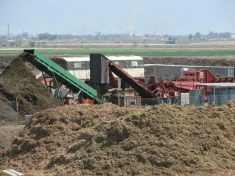 Bakersfield and the adjacent unincorporated area, have curbside green waste pickup using green-colored, green waste containers. The program accepts grass clippings, leaves, and branches less than 24 inches in diameter. Creosote-treated wood IS NOT accepted. The City of Bakersfield operates the Mt. 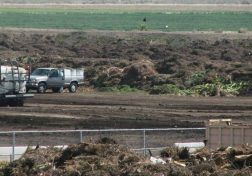 Vernon Recycling & Composting Facility to handle large amounts of green waste from landscape/garden professionals or from large residential garden clean-ups. You can dispose of palm and yucca trimmings here. Creosote-treated wood IS NOT accepted. See below. Grass clippings, tree branches, and construction lumber can be recycled at various disposal sites throughout the County. County Disposal Sites with an existing wood recovery program accept trees for recycling. 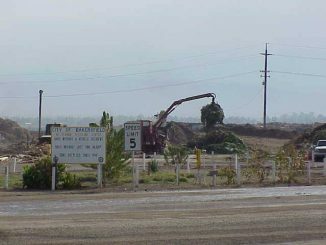 Residents can also take cut trees to the City of Bakersfield's Greenwaste Facility. Metro-Bakersfield residents can cut their tree into small pieces and place it into the green waste container as long as the lid of the container closes. Please remove nails, decorations, stands and tree bags. There are numerous drop-off locations throughout the County. See the link below to find Christmas Tree drop-off locations & tree pick-up organizations. There are several local non-profit community organizations in Metro-Bakersfield who will pick up your tree for a fee. 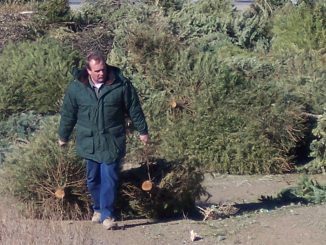 See the link below to find Christmas Tree drop-off locations & tree pick-up organizations. Most of the trees collected are ground and used as erosion control, co-generation fuel or as a bulking agent for compost.